Battle of the Branches this week! We’d love for you to join our team! Internships for Spring 2019 are posted, applications being taken during October – Apply today! Your donation makes a difference! Every donation (one pint) can save three lives, and every two seconds someone needs blood. The only source is voluntary blood donors like you. If all donors gave three times per year, blood shortages would be rare (the current average for regular blood donors is about two per year). Only 39% of the U.S. population is eligible to donate blood, and only 5-10% donate regularly. The need is constant and crucial every day. A blood shortage occurs anytime donations fall enough to strain the buffer that blood centers maintain in order to keep hospitals supplied. The blood center is responsible for making sure hospitals have adequate blood supplies at all times, especially in tragedies. We all have a responsibility to make sure we have enough blood at all times. A single car accident victim could need 50 or more units of blood in order to survive – your blood donation gives someone the gift of another sunrise, another hug, another chance. For more information about blood drives at UCF, contact blooddrives@ucf.edu or call 407.823.3094. The giving spirit of our Knight family shines in many ways – we invite you to save lives with us as we strive to foster a culture of blood donorship, educate our campus community about local and global blood donation issues, and create opportunities to donate blood. Blood Drives at UCF engages students faculty, and staff who serve on the Blood Drives Council, volunteer team, and intern team. We collaboratively work to host and market regular blood drives, special blood drive events, and educational events such as guest speakers. Together, we make a difference that matters. UCF is one of the most impactful donor bases in our region because of the generosity and commitment to community that are such an important part of our Knight culture. Thank you, UCF! 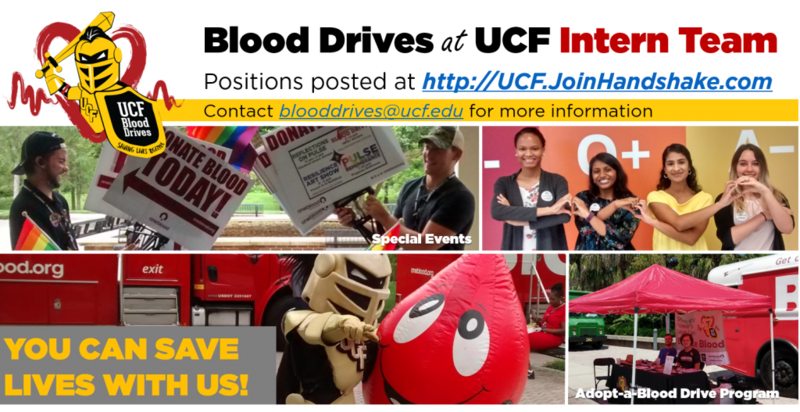 If you would like to join the team simply contact us at blooddrives@ucf.edu or 407-823-3094. THANK YOU FOR SAVING LIVES WITH US!